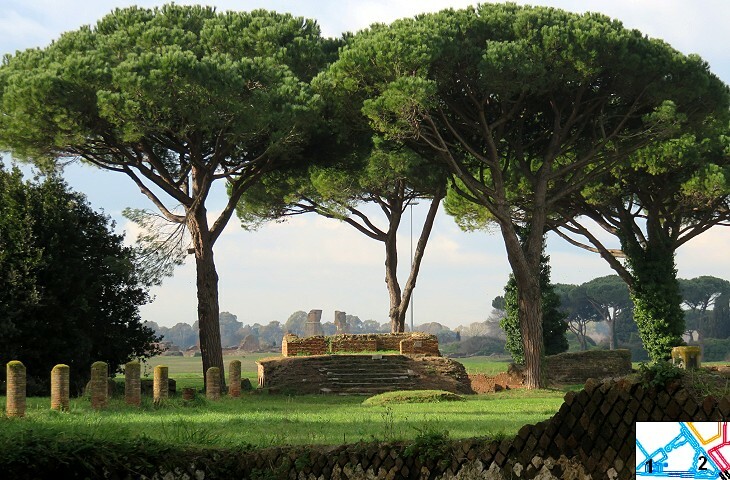 Travellers who entered ancient Ostia at Porta Romana found themselves in an area bursting with life because of its shops and baths. The very few who approached the town from Porta Laurentina felt as if they had arrived at a holy place. The area adjoining the gate is still redolent of its ancient religious character. Few visitors venture to this part of the archaeological site because it does not retain "must see" monuments and this adds to the magic of the place. Magna Mother was the name the Romans gave to Cybele, goddess of fertility, who was worshipped on the Anatolian tableland. In Rome she had a temple on the Palatine. 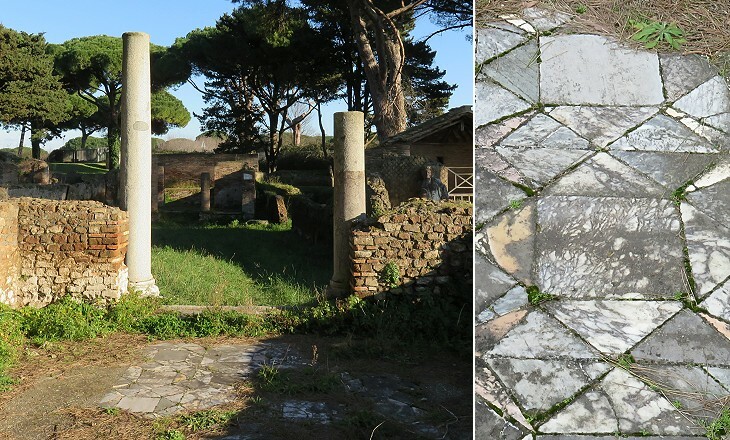 At Ostia a large triangular area (Campo della Magna Mater) was dedicated to her. A small temple to the goddess stood at one corner and it could be accessed by following a porch which began at Porta Laurentina. Won the tower-bearing goddess (Cybele) with his chaste passion. And said: Wish, you might be a boy for ever. May the love I fail in be my last love." In blood! Ah! Let the parts that harmed me, perish! And suddenly bereft of every mark of manhood. Toss their hair, and cut off their members as if worthless. 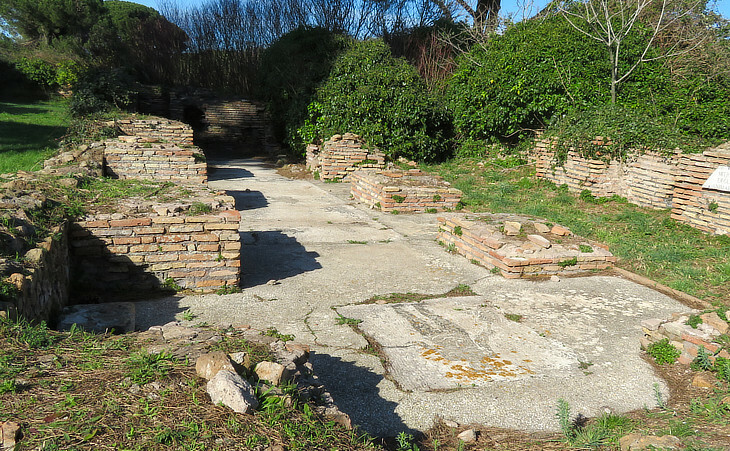 A small temple to Attis, the first priest of Cybele, stood at the opposite end of Campo della Magna Mater. The worship of Cybele reached its peak during a festival held in March which ended in frenzy. 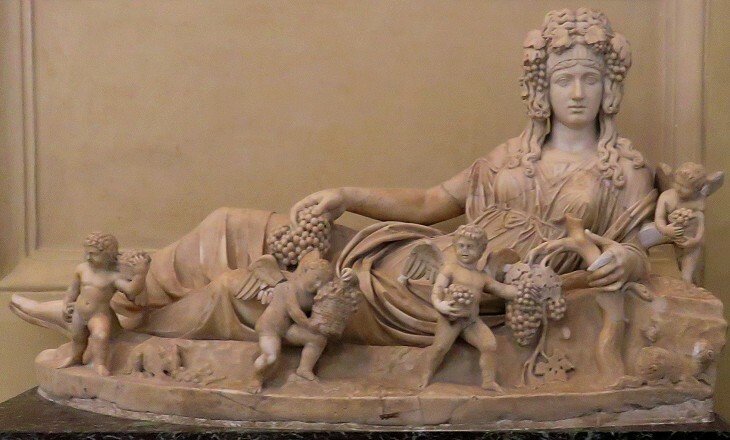 It had many aspects in common with Bacchanalia, ceremonies in honour of Bacchus/Dionysus, god of wine. 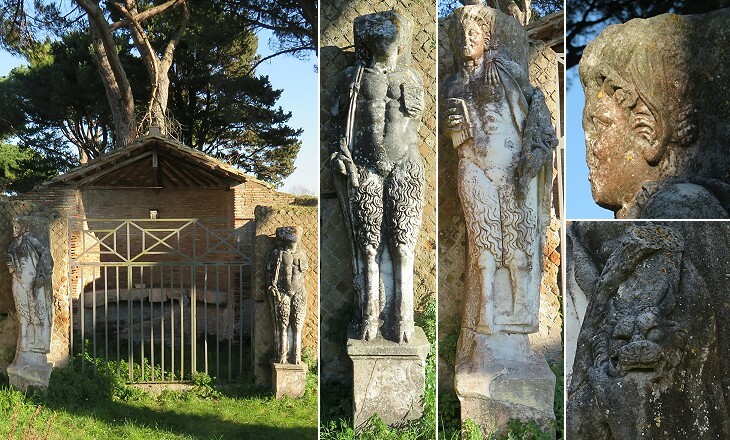 Attis was often portrayed with features typical of Dionysus and the satyrs at the sides of his shrine were associated with the latter god. And now the Roman rites were growing into disuse, not only in private, and within doors, but in public also. (..) the Senate commissioned Marcus Atilius, the city praetor, to rid the people of these superstitions. He called an assembly, in which he read the decree of the Senate, and gave notice, that all persons who had any books of divination, or forms of prayer, or any written system of sacrificing, should lay all the aforesaid books and writings before him before the calends of April; and that no person should sacrifice in any public or consecrated place according to new or foreign rites. The excerpt makes reference to events which occurred during the Second Punic War, but Livy wanted to express the reservations Roman upper classes at the time of Emperor Augustus had towards some aspects of foreign religions. Roman citizens were forbidden to emasculate themselves so they could not become priests of Cybele. 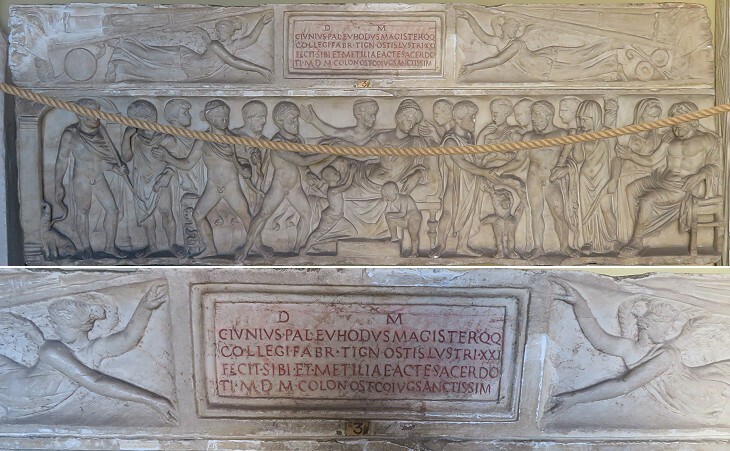 This may explain the presence of priestesses at the Magna Mater temple. Metilia Acte was the wife of an important man and she was defined as sanctissima (holiest) so we may assume she was a high priestess. 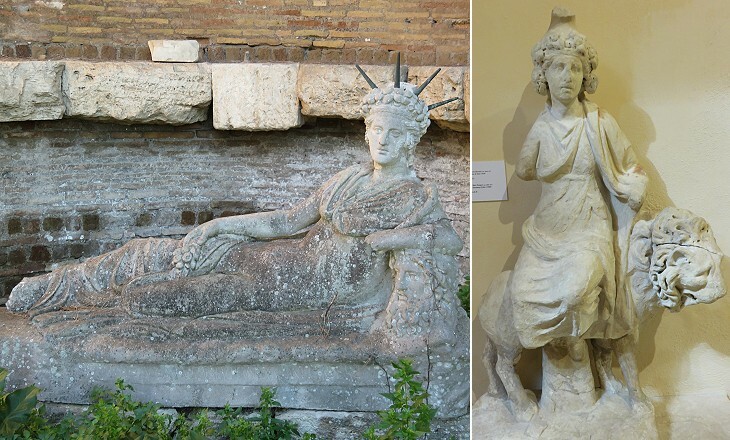 Excavations at Campo della Magna Mater unearthed many statues and reliefs associated with the worship of Cybele, including pairs of lions which were usually portrayed at the sides of her throne. The image used as background for this page shows a small statue depicting a snake around the trunk of a pine tree. Such a trunk was brought into the temple on the day of mourning for Attis' death (the young man wounded himself under a pine tree). The snake was "borrowed" from the iconography of other gods (e.g. Apollo, Minerva, Aesculapius, etc). The two heads shown above were found at Campo della Magna Mater, but the statues to which they belonged most likely were not situated there. 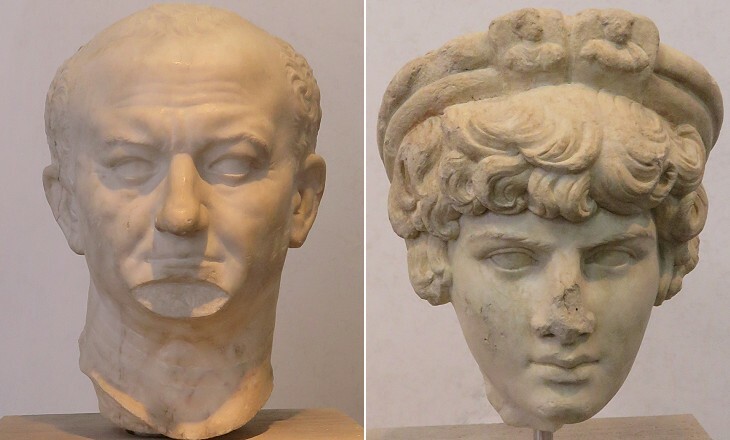 The head of Vespasian was probably made after the emperor's death and deification and it shows an effort to idealize his image. Antinous was portrayed wearing a crown, but not one which could be associated with the worship of Cybele or Attis. It was most likely the crown worn by the flamen (priest) in charge of the cult of the emperors. The small relief on the left side of the crown might portray an emperor (that on the right side is very worn out). 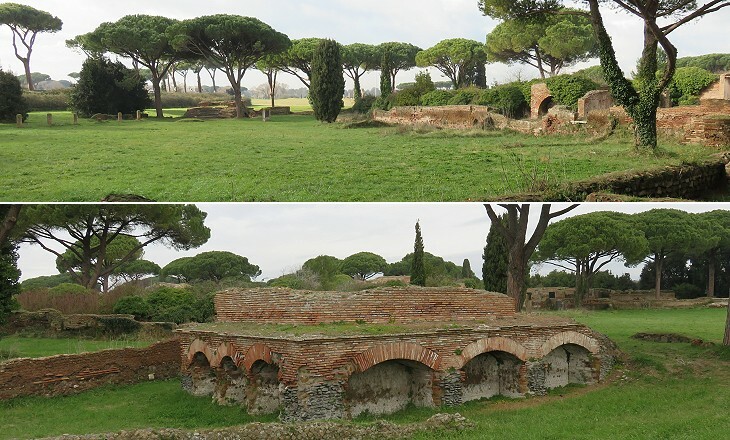 Campo della Magna Mater included two small buildings associated with the worship of Bellona, Roman goddess of war (Lat. bellum), from whose temple in Rome triumphal processions started. The Romans had a formal ceremony for declaring war: Pater Patratus (Father Spokesman), high priest of Bellona, set forth to the border of the hostile territory, and launched a spear tipped with iron, or charred at the extremity and smeared with blood across the boundary, pronouncing at the same time a solemn declaration of war. When this was not practically feasible the spear was thrown on the ground in front of the Temple to Bellona. Some ancient beliefs promised immortality, e.g. the Egyptian ones, at least for the pharaohs and their inner circle. The religion of the ancient Greeks and Romans was rather silent on afterlife. Zeus/Jupiter and the other Olympian gods were prayed to for help on matters such as war, sickness, pregnancy, etc. but not for providing continued life after death. Eventually traditional Greek and Roman beliefs were supplanted by new ones which paid more attention to afterlife. Mithra, a god whose cult initially developed in India and Persia, had many worshippers at Ostia in the II/IIIrd centuries AD. They were promised some sort of immortality by the priests of the god. The cult was reserved to initiates who were ranked in seven grades. Ceremonies took place in narrow and long rooms having at their end a statue, a relief, a painting or a mosaic portraying the slaying of a bull by Mithra. 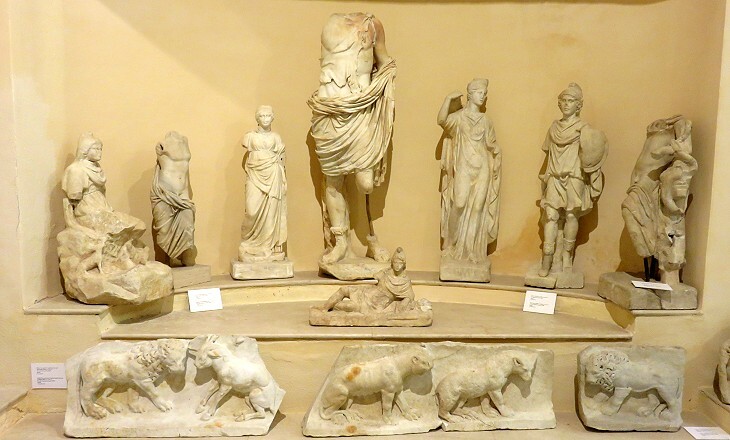 A mithraeum with access from Campo della Magna Mater was built in the IInd century AD. A small necropolis was excavated in 1855-1867 some 200 yards south of Porta Laurentina. 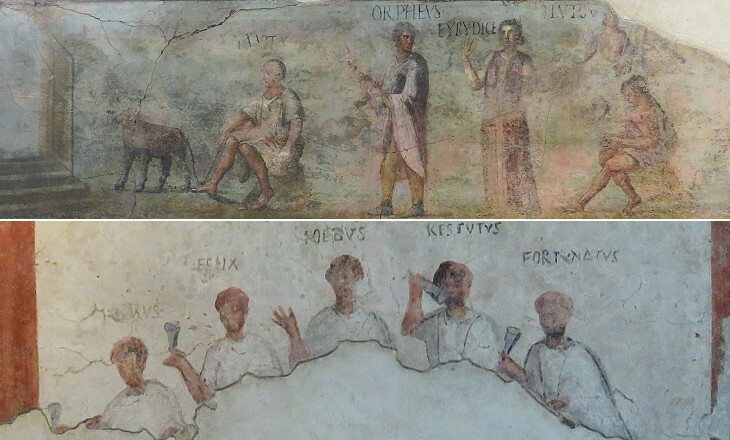 Some tombs were decorated with fine frescoes; that showing Orpheus and Eurydice is indicative of the attention paid in the IIIrd century AD to ways for escaping death. The depiction of a toast at a funerary banquet was a very traditional subject in tomb decoration (you may wish to see the funerary banquet painted in a tomb of Paestum in the Vth century BC), but this fresco seems a forerunner of a Renaissance "Last Supper".